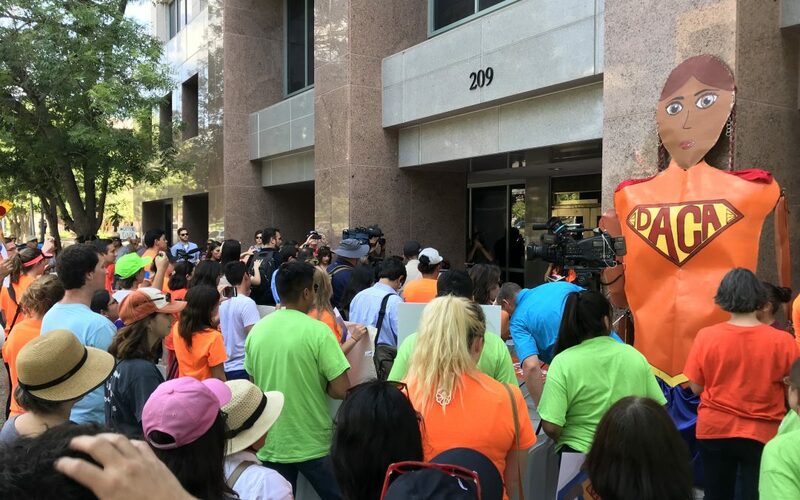 Photo taken outside of Texas Attorney General Ken Paxton’s office during a rally in downtown Austin, Texas, on August 15, 2017. Today, September 5, 2017, Attorney General Jeff Sessions announced the termination of the Obama-era DACA program. Now, nearly 800,000 DACAmented migrants are left in a state of uncertainty and despair. In dark and confusing times such as this, we all need the dissemination of helpful information rather than fear mongering. The Department of Homeland Security (DHS) has published a memorandum on the rescission of DACA. There is likely more to learn in the coming months, but for now, here are 5 Things to Know about the termination of the DACA program. 1. If your DACA status expires between now, September 5, 2017, and March 5, 2018, you have 30 days to renew! This means that your application for renewal (Forms I-821D, I-765 and I-765WS) must be submitted and accepted by October 5, 2017. The date of expiration is listed on your DACA card. You can also look your previous Form I-797C Notice of Action approval notice to see the date you filed and the dates for which your DACA card is valid. Your renewed card will still be valid for 2 years, as the Trump administration seeks to phase out DACA by March 2020. According to DHS, 201,678 individuals with DACA will have their DACA/Work Permits expire between August and December 2017. Of these individuals, only 55,258 already have submitted requests for renewal of DACA. This means that many people, especially those who filed their own applications, may not be aware of the impending deadline. Spread the word of the critical October 5, 2017, deadline. 2. If you have already submitted your DACA application and it was accepted before September 5, 2017, your DACA is valid until its expiration date. No one’s current DACA status will be revoked before it expires. Thus, if you have already submitted your DACA renewal application, it will still be processed and adjudicated. Unfortunately, you will not be able to renew the application in the future. 3. This memorandum does not allow for initial DACA Applications submitted after September 5, 2017. I had potential clients that could have qualified for an Initial DACA application last year except for the missing educational requirement. Unfortunately, they hesitated to enroll in a GED program, which would have allowed them to qualify at the time, because of they thought they would have time later. It’s now too late for people like them. I’m deeply saddened by the lost opportunity since they likely will not have many other avenues of relief. USCIS will still adjudicate Initial DACA applications that were received before September 5, 2017. 4. Advance Parole to travel abroad associated with DACA is NOT AVAILABLE. The memorandum states that no new applications for advance parole (Form I-131) will be accepted. Furthermore, and perhaps more importantly, advance parole approvals previously granted will continue to be honored. However, due to the political environment, travel outside the U.S. should be done with extreme caution because Advance Parole documents may still be revoked. I have known of incredibly unlucky individuals, none of them my clients, who were left stranded outside of the U.S. in situations like these. All pending advance parole applications will be “administratively closed” and all associated fees will be refunded. If you have an advance parole application currently pending, check your mailbox frequently for the return of the $575 filing fee. 5. Congress has been provided a 6-month window in which to pass immigration reform, or not. Encourage all you know to call members of Congress and encourage them to pass immigration reform. Remind them that in 1986, then president Ronald Reagan signed a sweeping immigration reform bill that allowed any immigrant who had entered the country before 1982 to be eligible for amnesty. Immigration reform is possible! The representative for your area depends on the zip code in which you live. To look up your representative, click the following link: https://www.govtrack.us/congress/members/TX#representatives. Many of these representatives are up for re-election in 2018 and 2020. Encourage your United States citizen friends and family to register to vote and advocate for pro-immigrant representation. A solution to our broken immigration system is badly needed not just for the DREAMers but for 11 million hardworking migrants who call the U.S. their home. Book an appointment to renew your DACA now to receive 50% off legal fees. Just mention this blog post when contacting me. Valid until October 5, 2017.